Last year, The Alley in Student Center East sold eight of its 16 pool tables due to lack of popularity. Its student manager, David Ramirez, said the game has experienced recent and increased popularity among underclassmen. Ramirez explained that when he first began his studies around five years ago, there was a group of students who played eight-ball pool together and organized tournaments. There was also a bowling tournament and students regularly practiced in the facility in preparation for the tournaments. Since that group of students left, and until now, the tables have been mostly empty. The tables that were sold made space for a study area that now exists beside the Poke Bowl Station. “Sadly, they were just taking up space. Sometimes only one of the 16 tables were occupied,” Ramirez said. Ramirez attributes the resurgence of interest to more students who are playing for fun and less so on a competitive basis. He referenced local pool halls that have closed and said he stopped playing the game because there is a lack of competitive interest among remaining players. 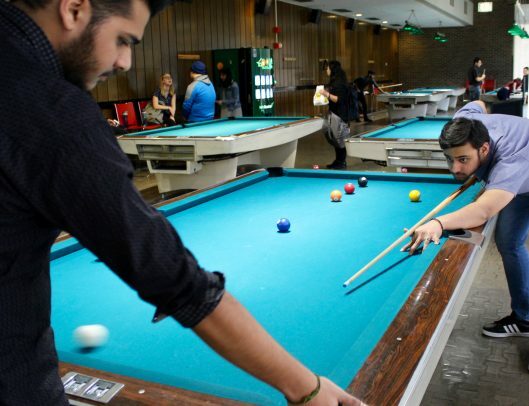 Omar Khan and Muhhammad Sunil said the pool tables are accessible to them as students. The location is convenient and the area is available to students who are under the age of 21, unlike bars. The two played a modified game of pool that resembles Snooker, which they learned to play in Pakistan. “The snooker table is bigger and taller,” Khan said. The modified game involves the use of scoring. Different balls represent varying point values. The two said when they play with the younger students who are less competitive and also less familiar with their modified game, they play eight ball pool. “Most of the crowd plays for fun,” Khan said. Ramirez said about 25 students would be sufficient to have a proper pool club that includes a tournament. Khan and Sunil said if an ideal club should include regular eight-ball pool, as well as both team and solo tournament options. Ramirez said the facility is meant to distract students from their schoolwork regardless of what level of competition is available. He said he’s happy the tables are getting use. “Now a lot of people are waiting to get on a table,” he said. Students interested in a club should tell the front desk of The Alley, so a running list can be created, and a club may be considered for next semester.